Similarly, more think household incomes have recovered than did so two years ago. But while 51% say there has been a partial recovery in incomes (up from 42% in September 2013), just 4% say they have fully recovered. 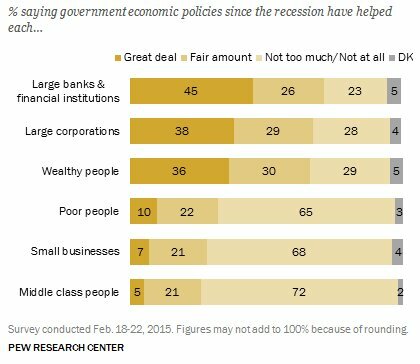 About four-in-ten 42% think household incomes have hardly come back from the recession. There has been less change since 2013 in views about recovery in the stock market and real estate. In 2013, majorities said both sectors had either fully or partially recovered, and that remains the case today. But there has been a 10-point increase since then in the share saying the stock market has “fully” recovered from the recession (31% now, 21% then).